MARIUPOL, Ukraine -- Hopes for a tattered Ukrainian cease-fire continued to fade Thursday with reports of fresh fighting near the Ukrainian port city of Mariupol. 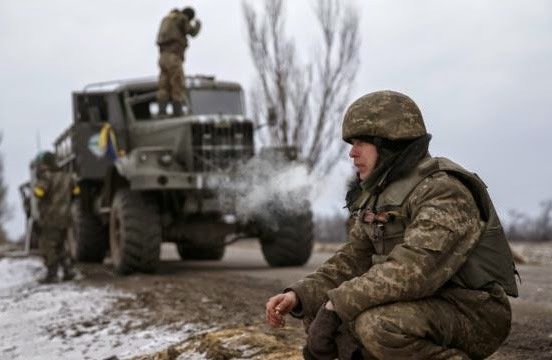 Kiev military spokesman Anatoliy Stelmakh said pro-Russian separatists - fresh from a victory over Ukrainian forces at Debaltseve - began the heavy shelling of the village of Shyrokyne on the outskirts of Mariupol on Wednesday. The main seaport in eastern Ukraine, Mariupol was the scene of intense fighting last year, before Ukrainian forces took control of the city. Local officials in government-held territory said rebels had also fired mortar bombs at another town further south of Debaltseve. Kiev fears they are massing for an assault near the major port of Mariupol, Reuters reported. In a statement, Ukraine's defense ministry said that 13 soldiers had been killed and 157 wounded during the withdrawal. It also said that 82 soldiers were missing, and more than 90 had been taken prisoner by the separatists. Poroshenko called for an international peacekeeping mission to restore calm to the area as well. The appeal was rejected Thursday by both rebel and Moscow leaders. Vitaly Churkin, Russia's ambassador to the United Nations said the proposal suggests Kiev is trying to undermine the cease-fire reached last week in Minsk, Belarus. The White House on Thursday said it was “deeply troubled” by reports of continued fighting and NATO's top military commander, U.S. Air Force General Philip Breedlove, said he did not think the truce had ever even begun.